Natural Born Citizen - A Place to Ask Questions and Get the Right Answers: 'Natural Born Citizen' Graphics - A Picture Says A Thousand Words! 'Natural Born Citizen' Graphics - A Picture Says A Thousand Words! Picture Says A Thousand Words! 95%+ of American "Citizens" are" natural born Citizens." and Commander-in-Chief of the Military Must be Chosen. Since His Father was Not a U.S. Citizen! Questions as to Obama's Physical Place of Birth Exist Too. These educational new graphics were created by an Erica at the http://www.jeffersonsrebels.blogspot.com/ blog. Another graphic using a Euler Diagram logical analysis format was done by TheBirthers.org. Whether using the left side or right side of the brain type imagery, the message is clear, Obama is NOT a Natural Born Citizen of the USA since his father was not a Citizen of the USA or even an immigrant to the USA when Obama was born. Obama and Congress described the Kerchner Complaint/Petition as "Fishing for gold coins in a bucket of mud." Indeed, it's only a bucket of mud in the eyes of those who shamefully refuse to see what is really there. But even with all the Obama-created mud, the gold is still there. Judge Carter made it a big part of his decision that Taitz/Kreep filed their complaint after Obama was sworn in as President on January 20, 2009. For those of you who might not know, I filed the Kerchner case before Obama was sworn in. This report is courtesy of William but we had to find a better link with a working/active link. Story at this BBC link. One slight subtle point on you new graphic ... the NBC requirement is used for the President AND Vice-President (and only there) in case you wish to be precies. Graphic Defining"Citizen" vs "Natural Born Citizen". 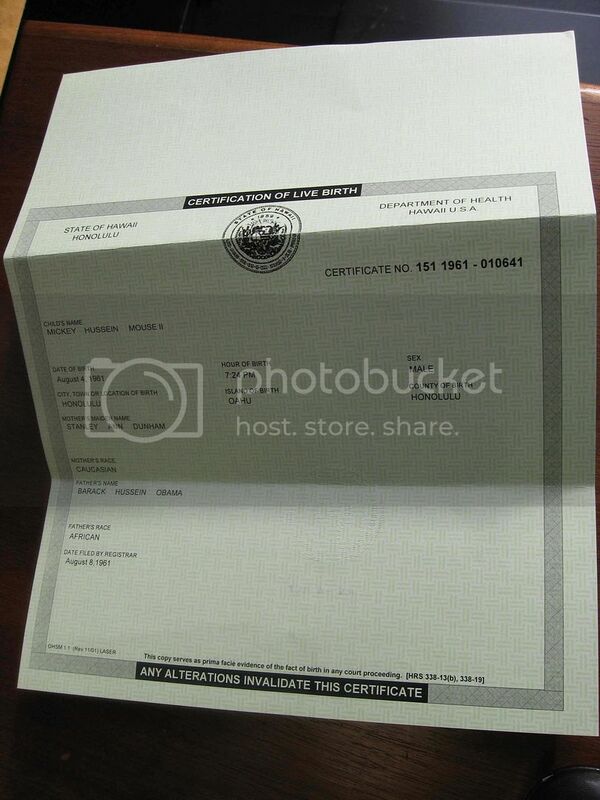 It specifically addresses the citizenship status of Obama's parents. Might be nice if this graphic could appear side-by-side with the other one. Speaking of being "precies" ... it's "precise". As our founders might have said - pardonnez-moi!! Nice graphic addition. But I think you could make the visual message stronger and more germaine if you put the British flag on the child Obama on top, since is loyalty and dreams were to his father ... and he does not like America based on his own words in his books ... and his recent actions. He's a citizen of the world foremost in his own mind. So if you can, switch those two flags on child Obama around to show Obama's real priorities, which are not to the USA. JMHO. Mother: "Natural born" U.S. citizen because both of her parents were citizens at the time of her birth; how their citizenship was attained is irrelevant. Term was defined by Vattel in "The Law of Nations" and adopted by our Founders when they wrote the Constitution, specifically and only in the eligibility clause for President, and for successors to the office. I received word that Kerchner thought the child's flags should be reversed. 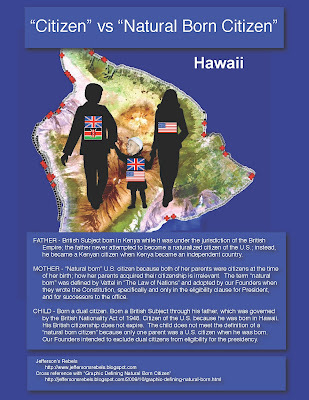 Initially, I created the graphic that way and then changed it because he was born in Hawaii, and it's instinctive to put my country first. However, I defer to the experts and have revised the image again with the Union Jack above the Stars and Stripes. P.S. I'm going to attempt to create a graphic that explains quo warranto, but I've got to do some homework first. It would be immensely helpful if someone could speed me along with suggestions, keeping in mind that the graphic has to be concise for people to quickly grasp the concept. I read that Puzo feels less strongly about this angle than does Donofrio, but it is still one approach to the problem, or at least one I generally understand. Excellent. I would also suggest a small change in the verbiage for the father. Kenya was not a country when Obama (Jr.) was born. It was a British Colony and Obama (Sr.) was a British Subject at that time. And under the BNA of 1948 Obama (Jr.) also automatically became a British Subject when Obama (Jr.) was born in 1961. Later Obama (Sr.) became a Kenyan citizen when Kenya became a country. It is not clear if Obama (Jr.) ever elected to avail himself of the opportunity to claim Kenyan citizen when he reached the age of majority. But it is very clear by international and British law that Obama (Jr.) when born in 1961 was a British Subject. Thus I think you should change the initial vebiage in your graphic describing the father and Obama Sr.'s status when Obama Jr. was born. You could add at the end if you wish that Obama Sr. later became a Kenyan Citizen when Kenya became a country. Excellent work. Keep up the good work. Back to the quo warranto idea with a question. According to Section 16-3503 of the federal quo warranto statute (http://michie.lexisnexis.com/dc/lpext.dll/dccode/10726/113cb/12677/1267c/1268a?f=templates&fn=document-frame.htm&2.0),"an "interested person" may sign a "certified complaint" without the permission of the US Attorney General or the US Attorney for DC." The complaint has to state facts rather than allegations, and the obvious fact is that Obama has dual citizenship. To date, no one has attempted to do this. Other than military personnel, can you think of any particular person(s) who would meet that definition? Or could absolutely any citizen take that initiative? 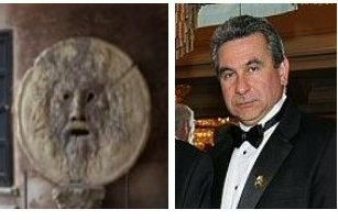 According to Donofrio, the process is simple (http://naturalborncitizen.wordpress.com/2009/10/08/quo-warranto-for-interested-persons/), but the person filing the complaint has to swear under penalty of perjury that the facts are accurate. I've always wondered why Donofrio hasn't done it. In any case, for me, the quo warranto graphic has to begin by defining an "interested person". I want to get this right. Thanks for all your great work on the graphics which really bring home the point of what an Article II "natural born Citizen" is. On quo warranto, see my new article posted at this blog. Will do. By the way, I hope you'll be able to find the time to replace the corrected graphic with the one that appears on your blog before someone downloads this one. I refined comments about the father and the mother. Done. I uploaded your latest version of the 2nd graphic with the flags reversed and the modification in the verbiage for the father. 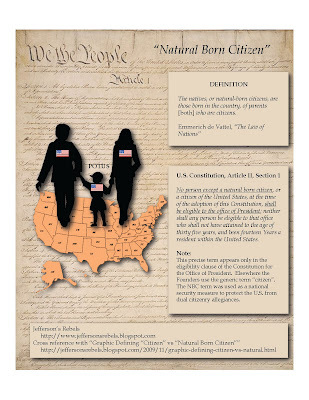 These graphics continue the educational process to the American people as to what an Article II Natural Born Citizen is, .. and Obama is NOT one. Thank you again for doing these outstanding graphics.